The ToteStand™ from Central States Industrial (CSI) takes all the mess out of using intermediate bulk containers (IBC) by providing fully automated batch or continuous ingredient delivery. The ToteStand works with a variety of bulk containers and drums. Various pump configurations are available to meet specific needs. The ToteStand increases worker safety while reducing product loss. The system's lower deck height, better drainability, and automatic level monitoring reduce product losses. Central States Industrial (CSI) offers a full range of hygienic processing equipment and services for the food, dairy, beverage, pharmaceutical, and personal care industries. CSI maintains an extensive inventory of fittings, tubing, pumps, valves, and instrumentation. The ToteStand is perfect for applications that require minor ingredients, colorants, and flavorings. 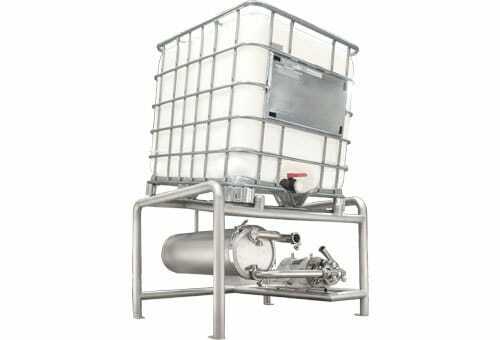 It is also used for processes that call for coatings, pre-mix, sweeteners, fats, and oils. Its efficient design with backup reservoir also suits many chemical applications. The system allows a tote to feed into a reservoir. From there, a pump can draw in the product and distribute it to one or more use-points in the process. When the tote is empty, the inline level switch sends a signal to a PLC (programmable logic controller) or local indicator. The operator can then replace the empty tote with a new one while the system continues to pull product from the reservoir. The system can be manual, semi-automated, or fully automated. The ToteTilter™ can also be integrated with the ToteStand. Literature for ToteStand have been saved to your dashboard! Literature for ToteStand are already in your dashboard.